What’s the point of camping if you can’t bring a few of your own brews along to enjoy the fire? Or – from a different angle – if you can’t keep your food and drinks cold while you’re out in the wilderness for a few days? The Yeti Roadie 20 Cooler is a compact cooler that holds about 14 cans and can keep your ice solid for days due to its 3-inch-thick, permafrost walls. The coolest part about this cooler (no pun intended) is that it’s certified as bear resistant and is virtually indestructible – that’s the kind of quality you should look for in a camp cooler! Sure, you’ve got a comfy, safe campsite, but why not go all out and get cozy and aesthetic with it? Your campsite is your home for the next few days – you deserve to love where you’re living! The Coleman LED String Lights with 10 lanterns attached is the perfect homey addition to any campsite. It’s fun, fashionable, and of course, super functional. You’ll have the best campsite in the campground with these bad boys! Just because you’re trekking into the wild for a rugged camping trip doesn’t mean you have to give up on good coffee, tasty drinks, or even adult beverages. The Better For Your Coffee Mugs are verified to keep your drink at an enjoyable temperature for longer than other mugs on the market. With several different colors, a double wall for insulation, and a super strong laser welded handle, it doesn’t get more convenient than these mugs! Camping with your love? There’s no need to sit separate! Get extra cozy with the Kelty Low Loveseat Chair. This awesome addition makes it easy to relax with your partner, your friends, or your family members. With a slight recline, a roll-tote carry bay, and a surprisingly light weight, there’s no reason to leave this chair behind! Never be without power again! The RAVPower Solar Charger is the absolute must-purchase item on this list if you and your camping crew can’t be without power. This compact, high-energy conversion product uses highly efficient solar cells to convert up to 21.5-23.5 percent of solar power into free energy. It comes with 2 USB device ports, is lightweight and portable, and utilizes Smart IC frequencies to output energy accordingly. It’s also a great addition for solo campers who need their GPS devices to be fully charged at all times for their safety. While this type of tent isn’t conducive to all campers, this is a must-have item for the solo backpacker who loves to camp in the spring and summer. This free-standing, two-pole tent is a must-have for your next 1-person adventure. Weighing in at only 3 pounds, this tent won’t take up space or weigh down your pack while you hike toward exploration! It’s well-equipped with gear pockets, a gear loft, stakes, ropes, strong zippers, and a polyester tent fly for water resistance. You can’t enjoy your camping experience if you’re consistently worried about how you’re going to schlep around all of your camping necessities – and even better, you can’t buy more of these awesome camping accessories if you don’t have a convenient, reliable way to transport them. This is where the OutdoorMaster Hiking Backpack 50L comes in. This multipurpose pack is spacious, made of lightweight material so it won’t weigh you down, is comfortable, and even features a waterproof rain cover to protect all of your valuables in case of a rainstorm! Capturing your experiences when you’re camping is a total must. The only problem? Camping is a rough-and-tumble game and bringing your expensive, fancy camera along could be risky. Enter the GoPro — the high-quality camera you want with the durability you need as a camper. The GoPro Hero7 is the latest from the GoPro brand. With its water-proof, scratch and chip resistant, and durable design, it’s definitely a game changer for your camping experience. You’re probably already dreaming up the perfect camp meal to cook for your friends over a roaring fire. No matter what you envision making, you’re going to be lost unless you have the proper tools available to actually eat your culinary masterpiece. The Orblue 4-in-1 camping utensil kit is the perfect addition to your camping expedition. It’s necessary, sure, but it’s also super lightweight, compact, and won’t weigh you down. It includes a camping spoon, a fork, a knife, and a bottle opener (because you know you want to bring some brews along!) All the utensils are made of non-stick, stainless steel and are guaranteed not to rust. Let’s face it – it’s not always easy to start a fire. Sometimes, you need a little more than just sticks, kindling, and good intentions. That’s where the Gerber Bear Grylls Fire Starter comes in! This compact starters uses a ferrocerium rod and a metal striker to get your fire going fast! The best part? It’s on a convenient lanyard so you don’t lose the pieces! 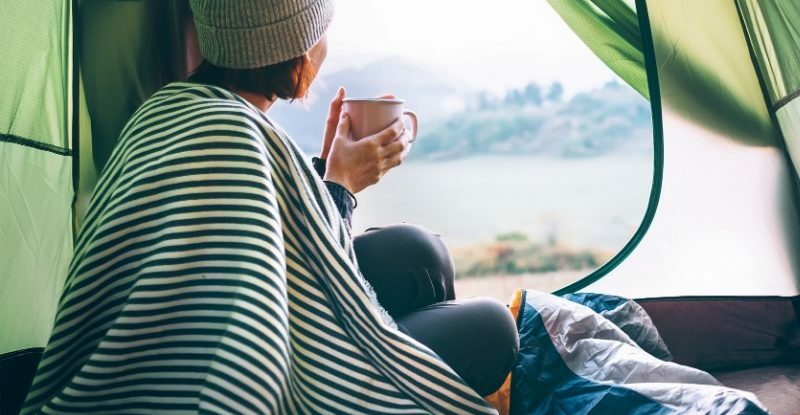 Succumbing to the camping lifestyle doesn’t mean you have to give up coffee – in fact, you probably need coffee now more than ever. With the Farberware Classic Stainless-Steel Yosemite 8-Cup Percolator, you never need to go without again. This sleek percolator can brew anywhere from 4-8 cups of coffee and includes a permanent filter basket so you won’t have to worry about wasteful paper filters. Light, polished, and convenient to transport, you’ll never have to be without your precious bean juice again!